Troy went through some rough patches and handled stress with food. 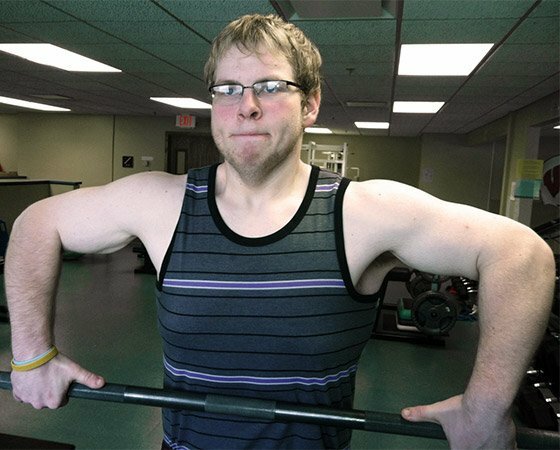 It took years to reverse his depressed actions, but now he is fit and fired up to help others! I grew up in a household where we always had food. We had big family dinners together. I was always bigger, but it never got out of hand because I actively played sports. I was in good shape. I attended Green Bay Packers football camps as a youth and even won MVP one year at tight end and another year in the strength and conditioning category. My weight gain story starts with my mom. She was extremely overweight for most of my childhood and eventually had weight-loss surgery. It was successful for her and she was able to lose a tremendous amount of weight. However, losing the weight led her to change who she was as a person. She began to think she was better than everyone else because she was skinny. She even made fun of overweight people we saw in passing. Within a year of her weight loss my parents got divorced. This was an emotional blow to me. I refused to talk to anyone or see a counselor. I gained more than 70 pounds in about six months from emotionally eating. I was still in sports and was active. My weight maintained over the next couple years until my sophomore year of high school, when my mom approached me to say she was leaving. She said she would come back every other weekend. That never happened. It was maybe once every couple months to eventually not all. I haven&apos;t seen or talked to my mom for more than six years. I was always a mama&apos;s boy growing up. By her leaving, abandoning our family left a tremendous amount of strain and stress on my dad, my brother, my sister, and I. My dad has been there for us the whole time. Without him I wouldn&apos;t be where I am now. My brother became extremely depressed. He attempted suicide on a couple occasions. He thankfully never was able to commit suicide. My sister was away at college, but she was usually strong too; she didn&apos;t usually show she was hurting, but she would talk to me sometimes. A person never forgets those moments. I was extremely depressed and turned to food for my comfort. I ate endlessly and munched on food. I never felt full. My weight skyrocketed. I went in for my football physical the following summer and weighed in at 420 pounds. I had gained more than 100 pounds in 4-5 months. I didn&apos;t want to believe it, but it didn&apos;t motivate me to do anything about it. I tried to play football, but it was hard. I wasn&apos;t in shape and I had no energy to play or practice and I admittedly didn&apos;t put forth a good effort. I was there to be there and to be around my friends, hoping it would make me feel better and make me forget about the hurt and pain. I kept eating because it made me feel better; food became the steady rock in my life. It comforted my dad and me. My dad and food were the two constant good things in my life. My dad, the doctor, my football coach, and others tried to talk to me about losing weight. My dad and doctor were more serious about it because they were worried for my health and were in positions to express their concerns. All this scared me but wasn&apos;t enough to sway me to start exercising or to eat healthy. I tried diets and quit them within a month. I lost some weight on them but put it right back on. I sat in my room playing Xbox and ate in the dark. I only left to eat more meals. I ignored my friend&apos;s texts or calls. I remember them coming to my house once to get me and I just sat in my room and ignored them. That is essentially how my last couple years of high school went. I went to school, smiled, acted happy, put on a show, and went home and play Xbox and sit in the dark. I would hang out with friends sometimes and it would be fun, but it was just temporary. Leaving my dad for college was extremely hard for me. He had been my rock and I did not want to leave him or my home. I picked the closest school so I was close to him, which was UW-Stevens Point. I didn&apos;t know it then, but that was one of the best decisions I have ever made. I was home on winter break from school when I had my first major breakthrough. My dad always nudged me to workout, to lose weight. He had a talk with me over break and for some reason this time it hit me. I went in and worked out for a whopping 15 minutes on the elliptical. It wasn&apos;t fast paced, high resistance, or intense. It was absolute hell. I was wiped out. I have not stopped working out since. I do more and more every day. I started lifting weights with friends at college and play basketball and am more active. I exercised, but wasn&apos;t eating healthy. I actually started to eat more. I was depressed and thought that since I was working out it was OK if I ate more. I came back home for the summer and weighed 435 pounds. I went home, was comfortable, working, working out, and eating healthy. I got down to 390 by the end of summer. When I went back to school the weight loss stalled. I went back to eating unhealthy because I was away from the comfort of home and my depression worsened. My lowest point arrived that semester my sophomore year of college. I was depressed, on edge, when I got news that a family member was having heart surgery. That was my tipping point. My roommate and best friend walked into the room and I was just lying on the floor in the dark in front of a fan. I lost all hope and felt as if everything was lost. I left school for a week to be home. I needed to be. My doctor asked me if I was suicidal. I answered honestly, told them, "Yes, I was thinking about killing myself," and I was thinking about it a lot. But I honestly wouldn&apos;t do it. I wouldn&apos;t cause that kind of pain or harm to my family. I did not care about myself at all, but seeing what my brother&apos;s suicide attempts did to my family made me realize what mine would do to them. I got put on high dosages of depression and anxiety medicine and started seeing a counselor a couple times each week at first and then once every week. That helped and I started feeling better. The next semester my family was informed that our dad, our rock, our hero, may have cancer. My depression worsened and all I did that semester was play Xbox and eat. I however continue to work out. I even tried going out for the football team to take my mind off of things. I went home at the end of the semester weighing 380 pounds. I went with my dad to his appointment where we would find out if he had cancer or not. I remember how nervous we both were, but I tried to keep his mind off of it while we waited. The doctor told us that my dad did have cancer and he would need surgery. We went out to the vehicle where my dad called my brother, my sister, and a couple others to confirm to them he did have cancer. I sat sobbing in the seat. My dad needed us to be strong for him. I couldn&apos;t feel sorry for myself. He was set to have surgery in late July. Before my dad went in for surgery we made a deal, a deal that was really the second major changing point in my weight loss journey. We made a deal to each eat 1,500 calories per day so he wouldn&apos;t gain weight while he recovered. This was successful for both of us. He did not gain weight, his surgery was successful, and his cancer has not come back! Over the next month I lost 30 pounds and got down to 350 before I went back to school. I worked out the whole year, ate 1,500 calories per day most of the time, and I still went out and had fun with my friends on the weekends. By the end of my third year at college I was down to 260! I went home over the summer confident that I could keep going. I worked in the kitchen at the local hospital, worked out, played tennis, camped, did yard work, and took long bike rides with my dad. I was more active than ever before and it felt awesome. The summer heat wasn&apos;t affecting me nearly as much as it had before. By the end of last summer I weighed 225 pounds. My body fat fell to 8.5 percent. People told me I looked good and didn&apos;t need to lose more weight, but I still wanted to. I set the goal to get under 210 by my birthday in November. I was able to get to right around 205 by my birthday. It was the best feeling I have ever had. Keeping my weight off is always going to be a battle. I never want to go back to where I was. I know my family and friends won&apos;t let me ever get back there though. I know I won&apos;t let myself get back there. My other main goal was to not change who I was as a person like my mom did. I wanted to stay who I was and I believe I was successful with that. I lost weight and I hope to inspire and motivate other people with my story. I lost a lot of weight, but any amount of weight a person loses is an accomplishment and anyone can do it with hard-work, motivation, and willpower. When I started working out I had some good friends to work out with. One of my best friends and biggest motivators and inspirations from the beginning was Jake Dassow. He provided me with workouts and meal plans on my journey, along with other advice. I worked out with a good group of friends at school. I stuck to weightlifting for the most part until this past summer. I played basketball, tennis, football, or other sports with friends. Late last spring and early in the summer I started doing cardio in the gym. I started with cardio acceleration: I did a set of weights and then did 30-60 seconds of some form of cardio like jump roping, box jumps, jumping, riding the exercise bike at a very high intensity, etc. I started doing cardio on a regular basis. I do a minimum of 30 minutes and some days I go up to two and a half hours. "I can&apos;t begin to explain how important it is to have a great support system around you throughout the journey." I struggled to eat healthy. I love food and 1,500 calories per day isn&apos;t a lot, especially when I ate way more than that before. I thought about quitting in the beginning. I wanted to eat food all my friends ate: pizza, chips, and cookies. But once I got to a certain point I knew I would keep going. I got so many compliments and words of encouragement from people, that I felt if I quit I would let them all down. I had bad days when I felt like it was hopeless to lose the weight. When that happened I would text my dad, or Jake, or other people in my support system, my best friends Cody and Phill. They were always there for me. I can&apos;t begin to explain how important it is to have a great support system around you throughout the journey. I harvested inspiration from them but also from people in the strength center at UW-Stevens Point. It was the best environment I could have been in to workout and lose weight. When a person starts losing weight they worry about what other people think about them in the weight room. I felt as if everyone would judge me and think to themselves, "What is that fatty doing in here?" Instead all I got were smiles, compliments, and encouragement. It made it all worth it, made me keep fighting and pushing. It inspired me to be better. The diet challenged me the most. I love food and it is hard for me to say no. The other challenging part was seeing my weight fluctuate. I could have a weekend were I drank and ate with friends on Friday night and Saturday night and on Sunday I could be up 10-20 pounds. A lot was water weight, but it was hard mentally for me. I got myself through it with help from my support system, emotionally and mentally. I will work out from now on. My dream would be to inspire and motivate others with my story. I would love to be a weight loss sponsor for a clothing company like Nike or Under Armour and spread the word that anyone who wants to lose weight can lose weight. They just have to find the inspiration, motivation, will-power, and put in the hard work. "My dream would be to inspire and motivate others with my story." Surround yourself with a support system that will be there for you throughout your journey. 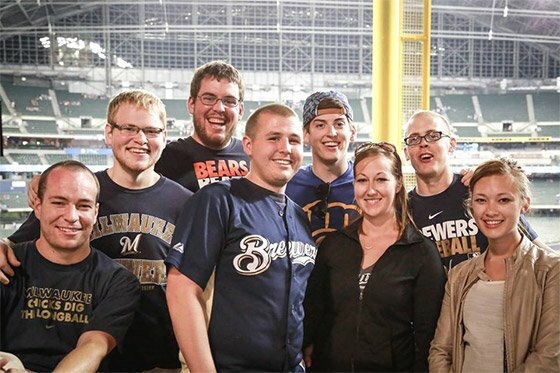 I would not be where I am without my family: my dad, brother, sister, my aunt Heidi, and my best friends Jake, Phil, Cody, and all the people from UW-Stevens Point and my home in Medford who helped me along the way. Don&apos;t be too hard on yourself. If you have a bad day, night, or meal, move on to the next day and tell yourself what you did yesterday is in the past and you control what you do today. The past may be dim or dark but your future can be bright if you want it to be. 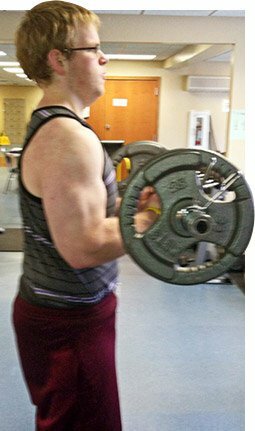 Bodybuilding helped me learn more about workouts. I would come here when I wanted to find out about a certain exercise and how to do it. If I needed some new ideas for workouts it was the one Website I went to. They also provided the best prices on the pre-workouts and other supplements and also gave me motivation with the stories of other people and with trainers like Jim Stoppani.